2001 – This one hour “rockumentary” takes us inside the life of Bruce Cockburn – the man and the musician – and includes live performances of Bruce’s hit songs: Lovers in a Dangerous Time, Wondering Where the Lions Are, If I Had a Rocket Launcher and And They Call it Democracy. Bruce Cockburn is a rock musician, singer/songwriter, political activist and Canadian icon. 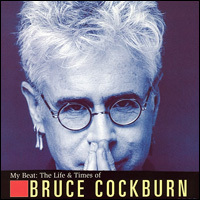 From his beginnings in the late 60s with the rock group, The Children, through his solo career and musical collaborations over three decades, Bruce Cockburn has followed his own path creating music that has defied traditional labels. His life informs his music. He has consistently expressed and maintained political views that haven’t endeared him to a mainstream audience. But his willingness to speak out on issues that many performers wont go near has earned him a strong following. In 1998, acclaimed singer/songwriter and activist Bruce Cockburn travelled to Mali, West Africa with a documentary film crew, led by producer/director Robert Lang. Over the course of several weeks, Bruce traversed this country, over half of it hugging the Sahara Desert, exploring its roots, people, ancient cultures, musical traditions and the ongoing struggle against drought and desertification. Along the way, Bruce jammed with musicians like legendary bluesman Ali Farka Toure and Toumani Diabate, master of the traditional 21 stringed instrument, the Kora. In the ancient city of Timbuktu, the film team visited prehistoric cliff dwellings in Sanga and met face to face with people working for a brighter future by changing the face of the desert. 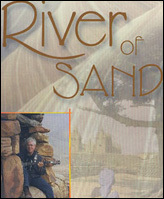 River of Sand, which premiered on Vision TV in October 1998, is a travelogue of a different sort – one that touches upon the cultural, musical, and environmental roots of Mali. 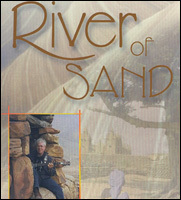 River Of Sand is available for Purchase from Kensington TV. 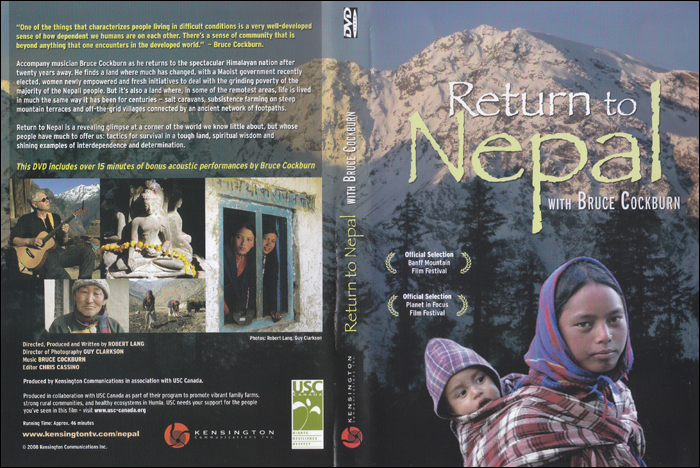 2008 – Producer/director Robert Lang and cinematographer Guy Clarkson accompany musician Bruce Cockburn as he returns to the spectacular Himalayan country of Nepal after twenty years away. He finds a land where much has changed, with a Maoist government recently installed, women newly empowered, and fresh initiatives to deal with the grinding poverty of the majority of the Nepali people. But its also a land where, in some of the remotest areas, life is lived much in the way it has for centuries salt caravans, subsistence farming on steep mountain terraces and off-the-grid villages connected by an ancient network of footpaths. 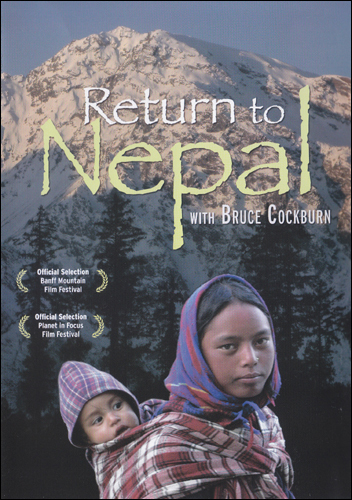 In 1987, singer/songwriter Bruce Cockburn went to Nepal to help publicize the work of world development organization USC Canada. Upon return he wrote, narrated, and created an original score for this film, based on photos by Tom Kelly, directed by Robert Lang in 1987. An intimate look at Bruce Cockburn, his life and his music. 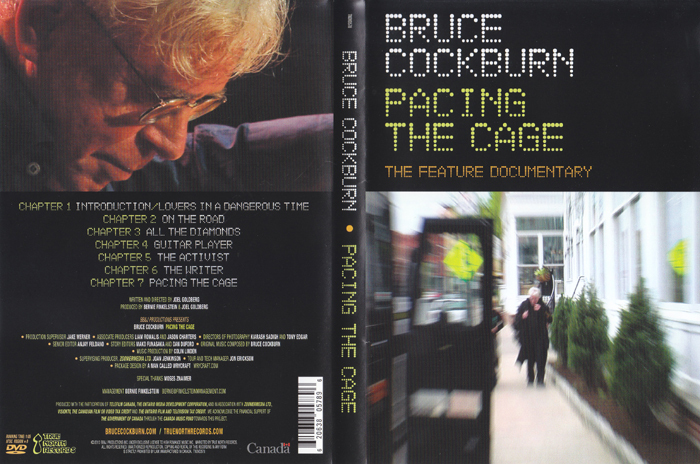 Pacing The Cage is a documentary that features Canadian singer–songwriter/activist Bruce Cockburn reflecting on his life and his career. The documentary features appearances by songwriters Jackson Browne, Sylvia Tyson, Bono, Sarah Harmer, Colin Linden, best selling authors Michael Ondaatje, William Young, Lt. Gen Romeo Dallaire and Bernie Finkelstein. Pacing The Cage follows Bruce as he performs in sold out shows, records his live Slice O Life CD, and participates in a series of benefit concerts. Documentary cameras also follow Bruce to his home for a candid conversation about his views on everything from religion to parenthood. The documentary will shed new light on Bruce’s spirituality, and his thoughts on activism, politics, writing, and his amazing 40–plus years in the music industry. The DVD features never before seen live performances of songs from his 40–plus year catalogue of music. The final scenes and interviews of the documentary are present day — we peek into rehearsals for the recent Luminato tribute for Bruce, and interview Bruce at his home. During this final interview, Bruce reflects about his life and career, and where he sees himself going in the future. Pacing The Cage gives viewers never before seen insights into Bruce’s life on the road, as a performer, master guitar player, activist and songwriter. 2013 – Pacing The Cage follows Bruce as he performs in sold out shows, records his live Slice O Life CD, and participates in a series of benefit concerts. Cameras also follow Bruce to his home for a candid conversation about his views on everything from religion to parenthood. The documentary will shed new light on Bruce’s spirituality, and his thoughts on activism, politics, and writing. The DVD features never before seen live performances of songs from his 40–plus year catalogue of music. 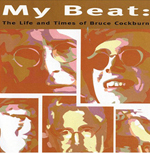 2001 – My Beat: The Life & Times of Bruce Cockburn is an intimate one-hour documentary that explores the life, music, passion and inspiration of a Canadian music icon. His life informs his music. He has consistently expressed and maintained political views that haven’t endeared him to a mainstream audience. 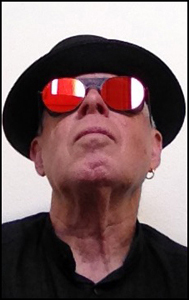 In 1998, acclaimed singer/songwriter and activist Bruce Cockburn traveled to Mali, West Africa with a documentary film crew, led by producer/director Robert Lang.